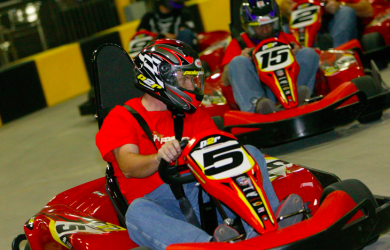 3 Same Day Indoor Go Kart Races Plus 1 year Race License from Pole Position Raceway for only $34.95! You can use these races at either the Corona or Murrieta Location! Racing is all about speed, acceleration and handling. That's why all the karts at Pole Position Raceway feature the latest state-of-the-art technology. Battle it out with your friends and family at speeds approaching 45mph in the high performance karts on the indoor track. Pole Position Raceway is an adrenaline-filled ride, and the ultimate racing experience. Voucher expires April 1, 2019. Not valid on holidays or holiday school breaks. All races must be used in same visit by one (1) person. Must be 48" or taller for junior carts. 56" for adult karts. Must be able to safely operate karts. Promotional value must be used in 1 visit. Limit one voucher per person per visit. Not valid for parties or groups. No more than 4 certificates can be redeemed by a single group.